Walking down Rothschild Boulevard in Tel Aviv these days, I can hardly recognize the street where I live. The normally laid back atmosphere has given way to a sea of tents, people, slogans, speeches, and music. The protest has entered its fourth week and it seems to be growing stronger every day, inviting people from all over the country to participate, perhaps for the first time, in a political demonstration. The protest started when a group of mostly young people began living in tents in order to draw attention to the increase in rent prices Israel has seen in recent years. I cannot imagine that any of them foresaw the events that followed: They were soon joined by students who had just finished their exams, by the workers’ union, by the doctors’ union that was on strike beforehand, by clinical psychologists, social workers, a new parents’ movement, and many more groups. The growing support has given the protesters a true sense of revolution—a word that is now being widely used. A few meters from my house, someone put up a big sign: “Corner of Rothschild and Tahrir.” Given everything Israel has borrowed from Arab culture—music, film, dancing, literature, slang, cuisine—could it be that, in the heat of this Middle Eastern summer, we are now borrowing politics from our Arab brothers as well? In the end, the comparison seems problematic. Unlike in Egypt, the right to protest is promised to us in this democracy and supported by the police. The crowd knows it and acts accordingly: The protests are quiet and non-violent, and integrate beautifully with the city atmosphere. And yet, while it may not be the same type of revolution that took place in Tahrir Square, it is impossible not to feel, when one is out in the streets, that one is witnessing calls for a fundamental change in the Israeli political system. In Egypt, the call was for a dictatorship to become a democracy. Here, it is a call for a change in the way we think of welfare and rights. Up until now, the Israeli sociopolitical narrative followed very strict rules. Average non-religious working Israelis, when they went to vote, did not think in terms of welfare but in terms of security, war, and survival. We have gotten used to hearing our leaders speak in terms of emergency regulations, nationality, and the need to unify and serve the interests of a country at war. 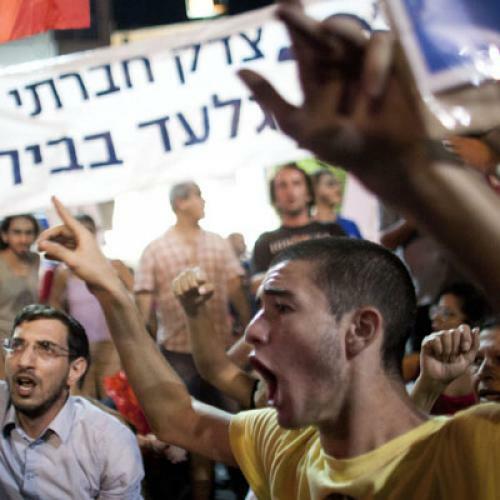 The military discourse has been fundamental to Israeli culture. It is a powerful discourse that is felt in every field of Israeli life, and is most predominant in our politics. Israelis’ relationship to the army is most intensive during their two to three years of national service, but the culture, the humor, and the daily discourse that stem from the army are inseparable from our lives afterwards. Now, the protesters on Rothschild Boulevard write a different narrative. The extremely high costs of living in Israel, and the income gap between the wealthy and the working middle-class, are reaching a level that can no longer be tolerated. The prices of housing, gas, water, electricity, and basic food products (dairy products especially) have all climbed. Meanwhile, the government, in order to maintain its coalition, has invested money in defending the settlements or supporting Jewish orthodox minorities. The protests are an indication that the silent majority is waking up. It is beginning to speak not just about nationality or security, but also about the welfare of average Israelis. Visitors to Rothschild Boulevard thus hear a language that, in some ways, seems new and foreign. But, like an old tune, it also brings back something romantic from our collective memory, from the language of the early years of the country and the stories we have heard about the glory days of the kibbutz. Israelis didn’t believe they could speak this language anymore, but now they are doing exactly that. Is there any chance that this language can move from Rothschild to the Knesset? Is there any hope that the many visitors to the tent protest will realize that the fight for welfare rights is inseparable from the fight for human rights in Israel and the occupied territories and the fight for peace in the Israeli-Palestinian conflict? It is difficult to answer these questions. The pessimists might well be right. A war or a conflict could easily put an end to this summer haze and return us to the language of nationalism and survival. Yet even if the protests do not yield all the change that we want, it is not unreasonable to hope that the ideas that have been put forward about welfare this summer on Rothschild Boulevard will, at least, give all Israelis a few more things to consider the next time they go to vote. Eyal Sagiv is a physician in Israel. He is currently a post-doctoral research fellow at the Weizmann Institute of Science.